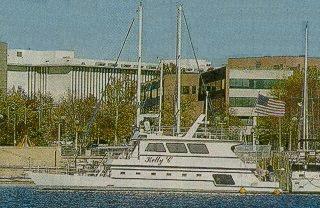 You asked for a vessel with a name like "KELLY C". That selection resulted in 4 matches. 7094 Via del Charro, Rancho Santa Fe. 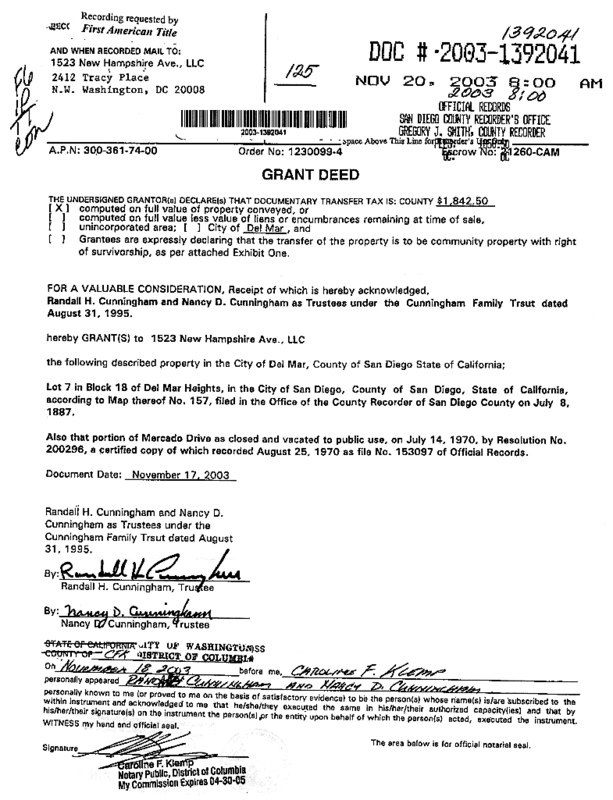 Also Randy's middle initial is "H," not "D."
Buyer of overpriced Kelly C has family @!#$ company @!#$ Cunningham's Rancho Santa Fe home. There are some unusual omissions by Cunningham in this recent Coast Guard document, and some real discrepancies from earlier reports. The document lists the Kelly C. had "no previous owners." But as has been reported, Duke purchased the boat from its previous owner, representative Sonny Callahan (R-AL). "Cunningham�s chief of staff, Patrick McSwain, calls the craft a 'Flat-bottom houseboat'.� However, this vessel documentation lists its draft as a very deep, 7 feet � hardly what anyone would ever try to call, "flat-bottomed." Who are they trying to fool? "The congressman calls it 'kind of a river boat'.� Ah, I hardly think any "riverboats" are ever 65' in length, 57 tons with 3 staterooms. "The yacht club�s dock master, Kelvin Lee, calls it 'huge,' and says it�s one of the biggest yachts on the club�s property." Huge is right — and expensive to buy, and expensive to dock. "Cunningham�s boat is berthed at the Capitol Yacht Club, where the congressman pays $350 a month to tie up his $200,000 home away from home." That is just not credible! (Unless someone else was "subsidizing it.") At the Gangplank Marina, where the Kelly C. was previously, slip fees and charges are well over $1,000 a month for a 65' boat, not a paltry $350. what was said in the article � about the price he also paid for the Rancho Santa Fe property. That is an awful lot of money for any congressman. Finally, I see he used the middle initial, "D." on this document instead of "H." or Harold as he has previously, on all his other legal documents. Has he legally changed his name? Obviously, there is conflict between what was said in the UT article and Cunningham's current Coast Guard vessel documentation. The question is whether Cunningham was just very sloppy in filling out the Coast Guard application form for the Kelly C. vessel documentation, or was he trying to hide something? The Kelly C sounds like a costly second home. Did he get it at a good price for the yacht from the former representative ($200,000) or did he have help from his military contractor friends or someone else? It's certainly not a houseboat. Thanks for saving that 1998 U-T article. It had some interesting information. Mine was built in 1987, although I bought it only four years ago as its third owner. Unlike Cunningham's, the current Coast Guard documentation of my boat does indeed list its two previous owners, dating back to 1987. I would think the Kelly C. documentation would likewise list its prior owner. Meanwhile, a review of other Coast Guard vessels' documentation shows that contrary to what I first thought, it may be not too uncommon to have missing, the "year built" or "shipyard", as Cunningham's does. But I still cannot tell how unusual it is, to not have listed a vessel's previous owner, as is the case here, with Callahan's name missing. I think it curious.